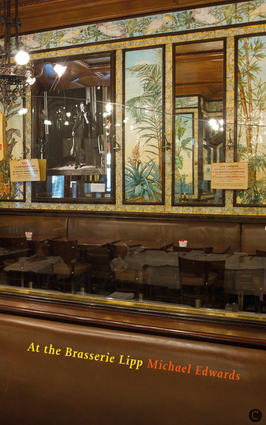 Seated at a table in the celebrated Brasserie Lipp, the author experiences 'this in- / fernal ticking in the ink' and finds memory coming alive, recovering past moments as intensely present, spots of time which vivify him and his past. Through memory and poetry he experiences revelation of a Christian depth. England is a familiar yet now a foreign country, the author having written for years in French. 'English becomes / a strange tongue echoing readily with names / gainrising with the new-born world they name.' The book includes ninety poems organized into thirty sections, each with three poems which are free-standing yet connected, speaking together. His English takes its bearings from the stress patterns of Anglo Saxon prosody. Michael Edwards taught at the universities of Warwick and Essex, before being elected Professor of Literary Creation in English at the Collège de France, Paris. The first Briton admitted to the Académie française, he has an Honorary Doctorate from the University of Cambridge, where he is also an Honorary Fellow of Christ's College. He has been awarded the OBE and a Knighthood in Britain, and the Légion d'Honneur in France.